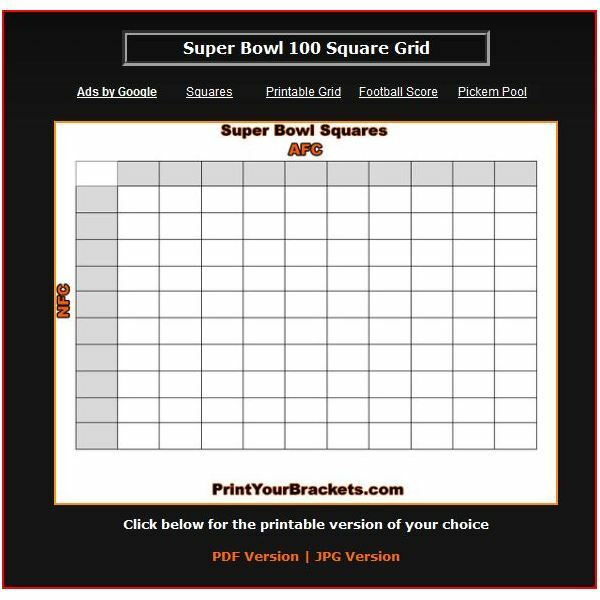 A Super Bowl square template is the means to make a well-organized, highly readable square with all the possible outcomes for scores per quarter or the final score. As soon as the playoffs are over and Super Bowl fever is in the air, it’s time to build yourself a square in the hopes of maybe winning some money from your family, friend, or coworkers. If there are any legal ramifications regarding this rather innocuous form of gambling, I’m just showing you where the templates are, so don’t drag me into it. But if the person holding the money disappears let me know, I know some guys that will find him for you. At any rate, the sources for the templates I’ll send to you have legal disclaimers anyhow. But the bottom line is that these squares are fun and make the game more interesting, especially if what is happening on the field corresponds with the numbers you chose (or were assigned randomly) on the box. 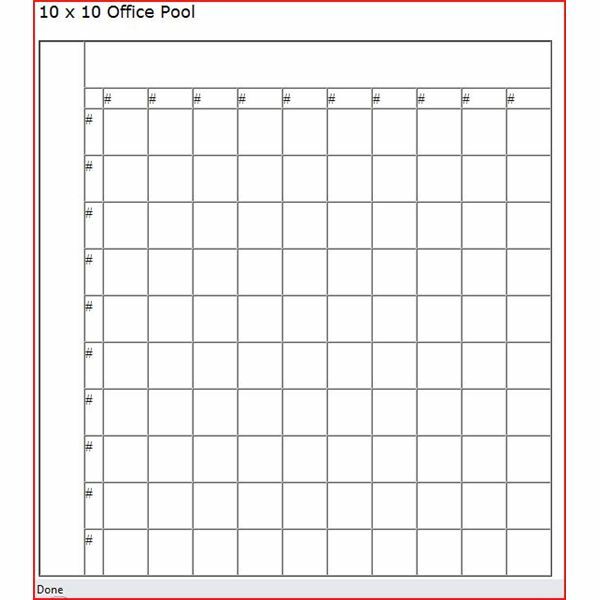 If you don’t know how one works, usually it’s in a 10 x 10 grid with a total of 100 squares (possibilities in probability parlance). Each square is initialized with the person who wanted that score. One team and the possible scores they might achieve runs horizontal while the other’s runs vertical. One of these combinations of numbers will correspond to the final score of the game. You decide how much a square is worth and then the winning square takes all the money home. Most square organizers put the numbers down first and let people choose, but others make it so it’s more random because obviously, some predicted outcomes are more likely than others (people counting on a two-point safety in the game rarely get it). So let’s get you to your first option for creating a custom Super Bowl square with the template at Numbers Templates. This template has Auburn versus Alabama on it, but the explicit directions on how to customize it using the appropriate NFL contenders are right there with it. It also gives you the option to hide or display the numbers. You can even change the colors and background to match the teams playing. This site even has a link explaining which squares are best to have in one of these from someone who has more gambling and statistical knowledge than me. Another place to get one of these is at Sports Betting Acumen. There’s the traditional 10 x 10 square and some more complicated versions you might be interested in too. Printyourbrackets.com is yet another great source as they provide the AFC and NFC sides already built-in for their representatives. Now that you have the means to make a square, it’s time to rally enough people to fill in the squares and fork over the money. A few well placed flyers might do the trick. 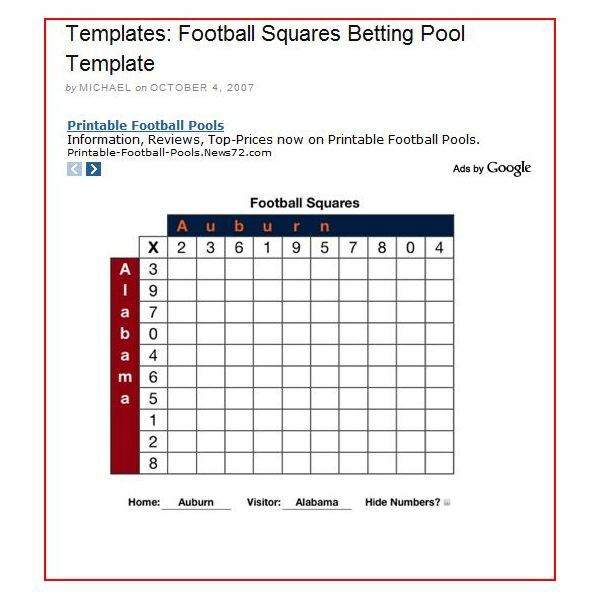 And after reading The Best Free Flyer Templates on the Web, you’ll know exactly how to make some good looking ones to promote your Super Bowl square pool.